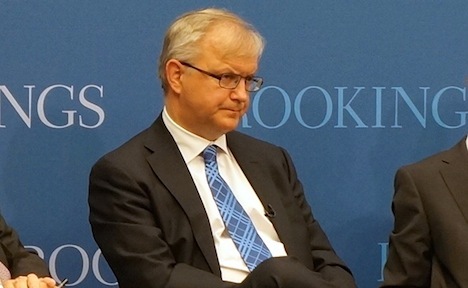 Olli Rehn (pictured above), European commissioner for economic and monetary affairs and vice president of the European Commission, thinks the eurozone will return to growth by the end of 2013. Klaus Regling, chief executive officer of the European Financial Stability Facility thinks there is no north-south divide in the eurozone. The three-step plan presented by Jeroen Dijsselbloem, president of the Eurogroup of eurozone finance ministers, for future growth comes down to: balanced budgets, banking union and structural reform. And, by the way, he thinks the main political problem in the eurozone is that European Union leaders have been so busy (for the past four years) dealing with the crisis that they haven’t had time to explain adequately their plans to the public. That’s a fairly audacious understatement of the democratic deficit problem in the European Union these days, and especially among the eurozone member states, who have had treaty upon treaty, condition upon condition dictated to them by Brussels and Berlin. 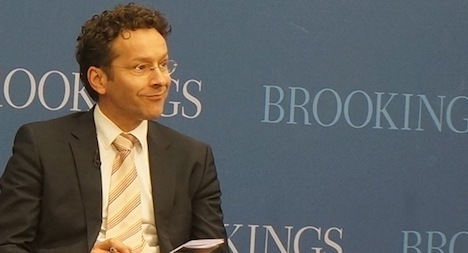 It also took two questions from the audience about deposit insurance for Dijsselbloem to confirm that their intention is for banking union reform to incorporate a eurozone-wide deposit insurance — in the fullness of time, of course. 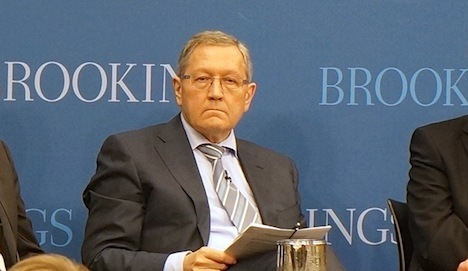 Regling (pictured above), one of five northern Europeans sitting on the panel today, went so far as to rebuke Jean Pisani-Ferry, a French economist and director of Bruegel, a Brussels-based think tank, for suggesting that the political risks in the European Union are rising. Reasonable economists can disagree about the policy mechanisms available to Greece or Italy or Portugal or Spain or Cyprus to pull their economies out of depression and how to repair the eurozone’s growing pains. I’m not going to argue that Italy is in no more dire need of labor market reform than, say Sweden or The Netherlands — of course, Italy needs to modernize its economy if it wants to goose its long-term GDP growth potential. Greeks have had to learn that income tax isn’t an optional exercise. And Germany needs to figure out a viable trade model where the eurozone doesn’t exist, as it seemed in its first decade, as a means of enabling the European periphery to buy all of Germany’s exports. But to refuse to see that there’s a north-south divide in Europe, that Mediterranean Europe is not at the center of today’s eurozone crisis, is abjectly short-sighted. Regling has to realize that even the north-south divide in Germany is stronger than the east-west divide, despite the separation of west from east for nearly three decades! It’s Italy that’s currently undergoing a crisis of government today, not France. It’s Golden Dawn in Greece winning their highest percentage of votes in the history of post-dictatorship Greece, it’s not a neo-Nazi resurgence in Germany. It’s Cypriot depositors who spent a week wondering if their five-figure savings would be taxed by 6.75%, not the Irish or the Latvians. That’s not to deny that Latvia and Estonia and Ireland have made incredibly tough decisions in the past four years, but none of those economies are even as big as Greece, let alone Spain or Italy. If eurocrats like Regling have such a hard time at Brookings, who are largely sympathetic to the goal of (if not always the precise strategies for) saving the eurozone, good luck dealing with Alexis Tsipras’s radical left Greek government or the next Silvio Berlusconi government in Italy or Artur Mas’s declaration of Catalan independence — all of which could happen by the end of 2014. 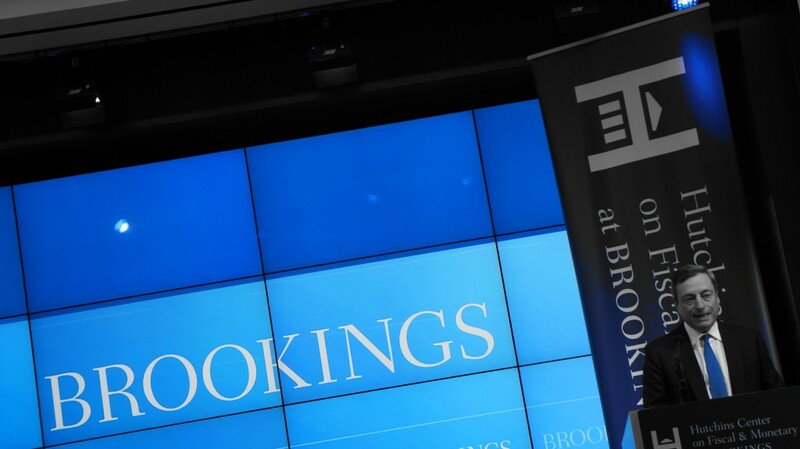 Photo credit to Kevin Lees — Brookings Institution, Washington DC, April 2013. 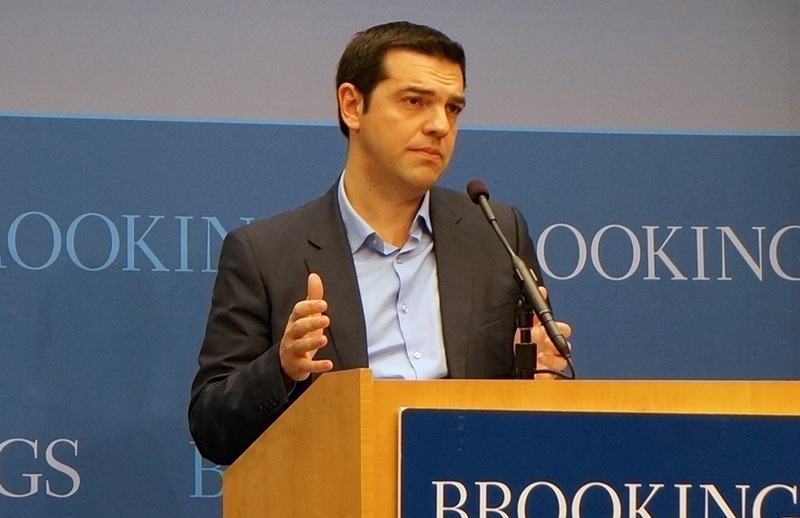 The great thing about Washington, D.C. is the flow of visitors we see from throughout the world and the relative access to top officials through top-notch organizations such as the Brookings Institution, which hosted Greek opposition leader Alexis Tsipras for a 90-minute session Tuesday. The beleaguered Greek economy has receded from headlines somewhat since the razor-close election in June 2012 (itself a rerun of an earlier inconclusive vote in May 2012) and since the conclusion of the latest agreement, reached in October 2012, between Greece’s government and the ‘troika’ of the International Monetary Fund, the European Commission and the European Central Bank for the disbursement of cash to the nearly bankrupt Greek government in exchange for €13.5 billion in budget cuts. Tsipras leads SYRIZA (the Coalition of the Radical Left — Συνασπισμός Ριζοσπαστικής Αριστεράς), which finished a very narrow second place to the center-right New Democracy (Νέα Δημοκρατία), whose leader Antonis Samaras, now prime minister, leads a broad pro-bailout coalition. Although SYRIZA lost the election, it’s the largest anti-austerity force in Greece, and it either leads or ties New Democracy in most polls. 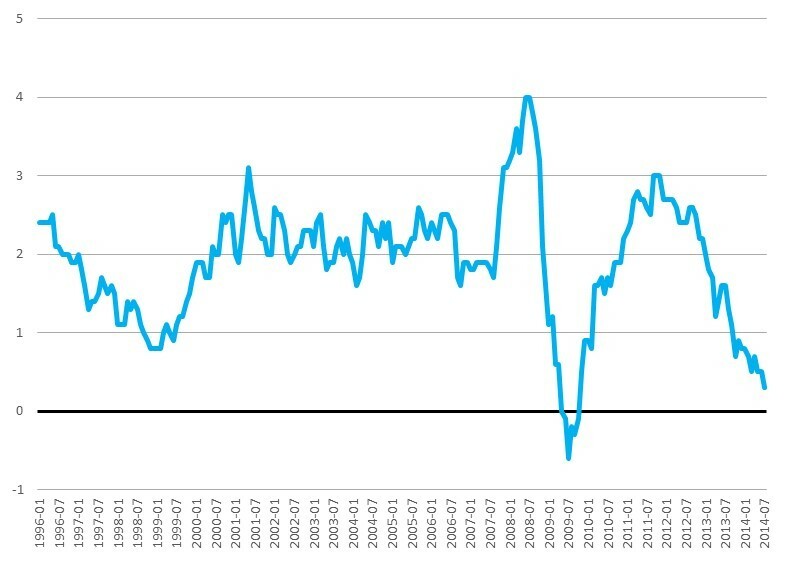 Given that Greece’s unemployment rate keeps increasing (it’s currently around 27%) and it’s entering its sixth consecutive year of economic contraction, even as the government’s been forced into adopting increasingly harsh austerity measures, it’s hard not to see Tsipras as a future prime minister. 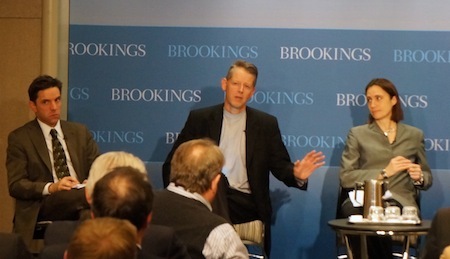 I had the opportunity to catch Princeton University’s Andrew Moravcsik (pictured above, middle) at the Brookings Institution yesterday for a brief panel discussion on relations between the United States and the European Union following the reelection of U.S. president Barack Obama. Moravcsik engaged with Atlantic columnist Clive Crook and other panelists on not only the direction of US-EU relations in Obama’s second term, but also whether US-EU relations are even incredibly relevant at all for an administration likely to have higher priorities. It takes a special kind of brass for an American to become one of the fundamental scholars of European integration, but Moravcsik is the father of the liberal intergovernmentalism theory of European integration, which purports that European institutions are essentially the creations of nation-states, and that supranational entities such as the European Union only have as much power as those states unanimously agree to provide them. It stands in contrast to the competing neofunctionalism theory that purports that institutions like the European Union gather more power through the spillover effects of integration, allowing them to grow and gain additional power as integration deepens, notwithstanding the wishes of nation-states. It’s a fascinating debate, and it’s especially fascinating to consider the consequences of both theories for the ongoing European response to the eurozone’s sovereign debt crisis. Needless to say, few political scientists — European, American or otherwise — have had as much influence on European integration theory as Moravcsik. As such, he’s long been one of my favorite scholars since I first studied European integration theory at the European University Institute, so it was somewhat of a pleasure to see him discuss US-EU relations in person — and not less than a 10-minute walk from home at that. There’s a lot of people in Brussels who say a lot of things, but what happens is what member states say. 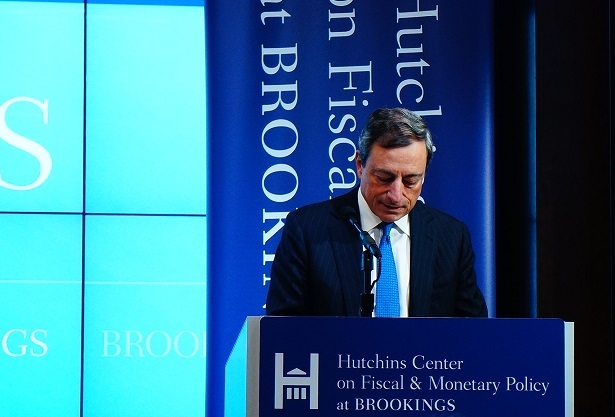 He pointed to the limited nature of participation in the eurozone — many members, including the United Kingdom, have not acceded to the single currency. 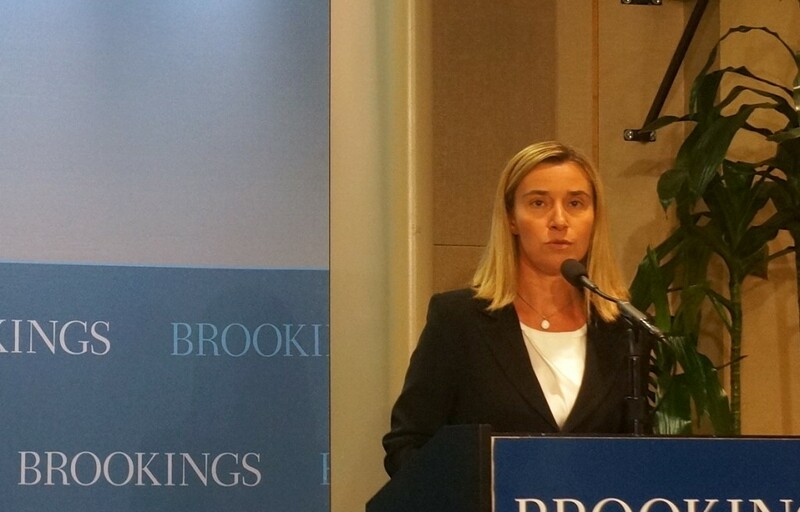 He also pointed to the voluntary nature of opting into any unified European foreign policy (e.g., the ‘coalition of the willing’ that included the United Kingdom, Italy and Poland, but few others, in support of the U.S. invasion of Iraq in 2003), the flexibility of European competition policy, and the opt-out nature of the Schengen Agreement that establishes the free crossing of borders throughout Europe, to which even some non-EU countries are party. He added that Turkey and, increasingly, Morocco are both, to some degree, integrated into the European Union, if not in quite a de jure capacity. 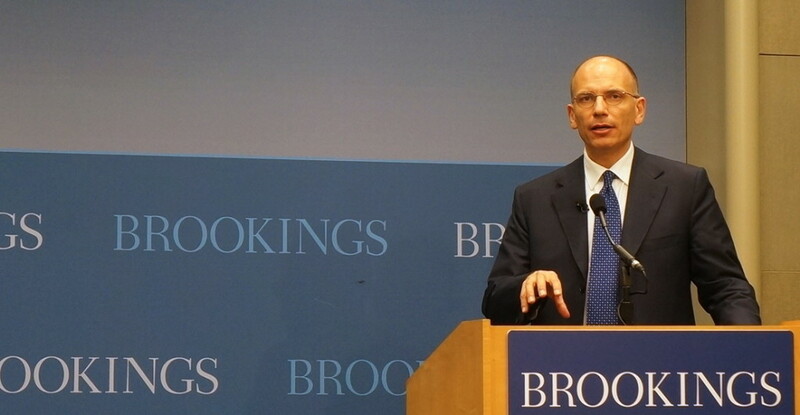 Moravcsik argued that US-EU relations are far more sanguine than, perhaps, has been reported, and noted the role that German chancellor Angela Merkel and European Central Bank president Mario Draghi played in preventing — or at least delaying — the kind of eurozone crisis that could have endangered Obama’s election. He added that U.S. and European interests are largely aligned and that when the Obama administration needs to call someone in the world with the will and means to support its goals, it’s still likely to call on Europe. He noted that the United States and Europe agree more consistently today than they did during the Cold War on issues as wide-ranging as nuclear proliferation, Israeli-Palestinian peace, consequences of the ‘Arab Spring,’ and environmental and climate change policy. As such, he dismissed the idea of a ‘pivot to Asia’ as nothing so much as overheated rhetoric, comparing it to the talk of the United States as a unilateral ‘hyperpower’ in 2003. In both cases, he argued that Europeans have (wrongly) taken American rhetoric at far more than face value. To the contrary, Moravcsik claimed that the ‘pivot to Asia’ talk was ‘drummed up’ as a strategic justification for the United States pulling out of Iraq and Afghanistan. That was perhaps a bit starker than I’d imagined. After all, Obama is headed, of all places, to southeast Asia for his first post-reeelction trip — to Myanmar/Burma, the first trip by a sitting U.S. president to that country in U.S. history. Broadly speaking, Moravcsik argued that large strategic shifts, like any ‘pivot’ to Asia, are accomplished only gradually over long periods of time. That strikes me as largely correct, but it nonetheless will be interesting to see what happens between now and 2017 on U.S. Asia/Pacific policy.